Contemporary urban studies, especially those in global cities often acknowledge the challenges in city planning and a variety of urban development problems that are associated with rapid urban growth. 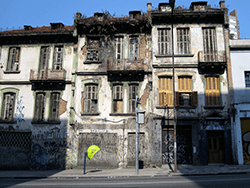 The city of São Paulo, Brazil, which is one of Latin America’s most developed urban agglomerations, is no exception. The lecture by Nadia Somekh draws on 40 years of theory and practice, using the case of São Paulo’s Bixiga neighbourhood as an entry point to explore how a critical approach to urban planning practices can help city planners move towards a more inclusionary understanding of heritage management.